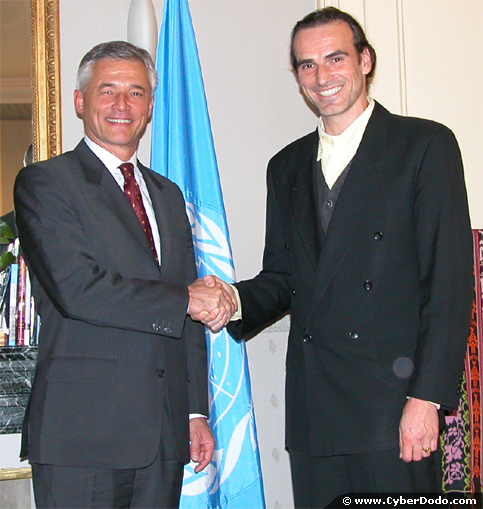 Upon Mrs. Robinson's completion of her mandate in 2002, Mr. Sergio Vieira de Mello, the new High Commissioner, inherited the « CyberDodo® » file. What does he do ? Is he satisfied to supervise it at a distance ? That was not Sergio's style. He studies the concept and not only approves it, but accords the project international dimensions. We shall remain forever grateful . However, on August 28, 2003, the UN High Commissioner for Human Rights was taken from us. His untimely death was as unjust as it was difficult to believe. Indeed, this man had truly embodied life by the respect that he afforded it, and the determination with which he defended it. Anyone who had the opportunity to meet him was immediately drawn to his total engagement in a cause for which he was prepared to sacrifice everything, in the spirit of Doctor Korczak. Having had the privilege of his support for our fight for children's rights, we would like to share with you some of our memories of this man. His straightforward manner and his ease with others impressed everyone you trusted him immediately. How so? Sergio treated every human as an equal - of the same importance, of the same nature, and on the same level. He recognized in others the same rights and duties that he saw in himself. Seemingly so simple, yet so rare in reality. This Diplomat of the highest order, family man, reflected you, your children and goals - your life. He put all his intelligence and influence to work to foster progress; in our case, supporting the promotion of the International Convention on the Rights of the Child through the medium of our animated series. Without ulterior motive, he was a man of his word, frank and resolute. Sergio Vieira de Mello did more than leave a legacy, he lived his life in the service of his fellow man, of all men. He leaves us with the words that we must work to make a reality: respect, understanding, dialogue, peace, sharing, love.